Vol. 35 No. 15 $5 a copy. $169 a year. The story of Troy-based Horizon Global Corp. is one about ambition and tragedy. The towing and trailer equipment manufacturer spun out of TriMas in 2015 with a quest to expand globally, and quickly. But the death of an executive’s child and an overextended acquisition strategy in Europe, crippled the company’s operations and changed the company’s priorities from success to survival. EACH WEEK DON’T MISS OUT ON CRAIN’S SPECIAL REPORT! Your goal was to work for corporate America. Why did you stay in the a? Michigan Secretary of State Jocelyn Benson said she will unveil changes designed to shorten wait times and fix broken self-service kiosks at branch offices where people renew driver’s licenses and conduct other business, the Associated Press reported. Benson, who took office in January, has visited all 131 branch offices. She released her findings Thursday, her 100th day on the job. One-third of self-service stations were broken and in general were difficult to use, the Democrat said. Many customers have to wait in line far too long to access basic state services, she said. The changes fall broadly into two categories: modernizing interaction with Michigan residents and improving operations in branch offices. Among Benson’s plans are exploring multiyear license plates, automatic driver’s license renewals and upgrading offices. She recently pulled down an online appointment system available in some branches because it was giving customers inaccurate wait times, but her office has begun redeploying the technology. The rise of wind energy in Michigan is also driving clean energy job growth, with more workers manufacturing and installing wind turbines. Midwest, and Environmental Entrepreneurs is a group of business leaders and investors that advocate for clean energy and have invested in more than 2,500 companies. The two groups partner to analyze clean energy jobs in a 12-state footprint of the Midwest. They began making annual reports in 2016.
steel precision castings from its customers in the defense industry. The company has poured $1 million into new equipment, which went toward a new machining center and an upgrade to foundry operations, company president Bruce Barron said in a statement emailed to Crain's. The manufacturer is also tacking on a second and third shift at its Oxford manufacturing facility and boosting its workforce by 30 percent, according to a news release. Since November, the company has hired 25 new employees and expects to hire another 15 over the next three months, Barron said in the email. Today, the company has 70 employees. Established in 1983, Barron Industries produces ferrous and non-ferrous precision machined castings and complete assemblies, the release said. CORRECTION  Last year Michigan hops farmers harvested 400 to 600 tons of hops. An incorrect amount was given in a story on Page 15 in the April 8 issue. FEATURED SPEAKERS: CEO, Agree Realty Co.
Crain’s Real Estate NEXT brings together a group of experts to share their perspectives on the retail landscape driving Detroit and neighboring suburbs. Vice President, The Taubman Co.
Register at crainsdetroit.com/NEXT Contact Lisa Rudy at lrudy@crain.com for sponsorship opportunities. DETROIT’S SISTER PIE OUTLINES AN EVOLUTION Detroit bakery Sister Pie at 8066 Kercheval Ave. plans to expand to a second location while keeping its original, which opened in 2015. James Beard finalist plans 2nd location with cafe, groceries, classes “Hopefully that ess than a mile from the cramped West Village headquarters of popular Detroit would allow us to be even more bakery Sister Pie, there’s an old boarded-up grocery store. sustainable. … We In it, Sister Pie owner Lisa Ludwinski sees a multifaceted expansion that could could start making help her growing business surmount obstacles and respond to community needs. It in- things like cereals, cludes building a new cafe and small grocery store. or we can use even Ludwinski, a finalist for a James Beard Foundation Award, plans to expand her pie-cen- more of our tric enterprise to an 8,000-square-foot second location at 8110 Mack Ave. The bakery ingredients to push would keep its storefront since 2015 at 8066 Kercheval Ave., at the intersection with into the grocery section of our store.” Parker Street on an east-side Detroit corner that has changed a lot in the past few years. Despite encouragement by the FDIC, there have been only about a dozen new charters approved in the nation over the past five years. Big banks continue to consolidate while smaller banks have been acquired or shuttered — the economic downturn cut the number of community banks in Michigan from 22 to six. Farr, whose Bank of Birmingham survived the recession and was acquired by Ann Arbor-based Arbor Bancorp in 2017, saw a void in the market, especially for medium-sized businesses, and set forth to fill it. Mi Bank will operate a “high-end” branch in a 1,400-square-foot office space at 3707 W. Maple Road, where clients can sit down with one of four bankers. The branch will offer a full range of banking services, including loans, deposits and mortgages. Under a five-year contract with fintech company Fiserv, the bank will be digitally focused and allow customers to do electronic deposits and online transfers via mobile app. Farr said the bank’s target clients are businesses with $25 million of revenue or less and those seeking loans between $500,000 and $5 million. Big banks typically focus on loans upward of $5 million, leaving strong demand from smaller companies for banking services. Tammy Carnrike: Foundations use as a forum. Kyle Caldwell: Nonprofits major economic driver. Foundations and other hosts are still finalizing topics for their sessions, but three have working themes, said Kelly Weatherwax, director of communications for the Detroit Regional Chamber. Those are: JJC.S. Mott Foundation will focus on transforming municipal funding. JJW.K. Kellogg Foundation will focus on the 2020 Census. JJWilliam Davidson Foundation’s session will focus on the Detroit region’s entrepreneurial ecosystem. This is an especially important moment for the city of Detroit, the region and state, said Darin McKeever, president and CEO of the Davidson Foundation, a newcomer to the conference stage this year. “We’re benefiting from an increasingly diversified economy (and) economic growth has been accelerating in recent years,” he said. “Still, there are concerns about talent shortages, how we develop our workforce and the sustainability of our economic growth.” The foundation’s grantees have some valuable ideas about how to support entrepreneurs, scale businesses and strengthen the economy, McKeever said. During its hosted session, the Davidson Foundation will offer insights from some of its grantees, including the New Economy Initiative, local entrepreneurs and a representative of global nonprofit Endeavor, which supports second-stage entrepreneurs. (From back left clockwise) Carol King, business development manager; David Inman, on-boarding engineer; Ravindra Rapaka, product lead; and Zaki Shalhout, product lead, at Aquasight that works out of an office building in Troy. Aura, an Aquasight platform designed for municipal water departments, tracks the flow of water in a city in real time using data from the city’s hydraulic models, meters and water quality tests. COM M U N IT Y We travel your roads and live on your streets so we know well what is important to your community. Local knowledge and personal understanding – it’s all connected. The U.S. market size is nearly $24 billion and growing. Data management is beginning to take up a larger chunk, with firms of all sizes flooding the market. New York-based water tech company Xylem Inc. is one of the most dominant domestic companies in the space, with about $4.7 billion in annual revenue. The French firm Veolia Water, a $14 billion a year company, is also gobbling up market share. But there are dozens of smaller ones — Wisconsin-based Aquarius Technologies LLC, Vancouver-based Aquatic Informatics Inc., Kansas-based Atonix Digital LLC, to name a few. “There are a plethora of AI companies entering the sector nearly every day — this is a transformative thing going on in the sector,” said Sue McCormick, CEO of the Great Lakes Water Authority. “The first big innovation was smart meters. That was the birth of using data and beginning to mine it.” The GLWA serves 127 communities in the southeast part of the state. With a treatment capacity of 1.72 billion gallons of water per day, it is the largest water and wastewater utility in Michigan and one of the largest in the nation. It is also one of Aquasight’s most important sponsors. The GLWA is contracted with Aquasight to use two of its platforms: Aura and Apollo. Aura cost the utility a one-time fee of $100,000 to set up. As part of the deal with the GLWA, communities under its umbrella can opt into the technology by paying a subscription fee, which is one penny per resident per year, Lunani said. Dearborn Heights was among the first to sign on, and several others have come aboard since. In 2017, Dearborn Heights entered a threeyear contract with the company, which cost a $10,000 on-boarding fee and $2,458 per month, according to the contract. Mayor Daniel Paletko said the program has eased pressure on the water department staff and provided peace of mind for the city and its residents regarding water quality. “I thought, after Flint, we oughta be looking at more things to make sure the water quality is fine,” Paletko said. As for Apollo, the technology tracks the GLWA’s chemical usage and mines data from the pumps, blowers and mixers at its treatment plants to maximize O&M efficiency. Aquasight was awarded a $160,000 grant from the U.S. Department of Energy in 2016 to deploy the technology with the GLWA in a pilot program that ends in 2020 with the possibility of extension. McCormick said the technology helps water departments move from being “responsive to being proactive.” “What we’re advocating is this type of artificial intelligence tool as a benefit for our member communities, to see what’s going on in their system overall, which is otherwise very difficult to understand,” McCormick said of the Aura program. Aquasight’s technology has resulted in $2.8 million of annualized savings for the GLWA, according to the utility. Despite the success, it faces stiff competition from other data management firms, especially those with more capabilities. Last year, the GLWA hired Pure Technologies, which was acquired by Xylem around the time of the deal, to detect structural weaknesses in a water transmission pipe in Oakland County. The 18-month contract is worth about $2.3 million. “AI is making its way into the water sector, and I think it’s going to help us with performance, consistency and quality,” McCormick said. ay now, or pay more later. That was the bottom line among panelists at a “Solutions Summit” about Michigan’s road-funding crisis last week sponsored by Crain’s and The Center for Michigan. Panelists made the point that we’re already paying for Michigan’s bad roads, from the obvious bent rims and broken springs, to the cost of farmers’ bruised produce that can’t be sold, to the intangible cost to our state’s reputation. There is broad agreement that the price tag right now for improving Michigan’s bone-rattling road problem is somewhere north of $2 billion a year. Gov. Gretchen Whitmer’s proposal to get that money with a 45-cent gas tax increase has caused some leaders in Lansing to balk at the cost, saying raising gas taxes to the highest in the country is too much for taxpayers to swallow in the space of a year. Taxpayers already saw the gas The cost of doing tax and vehicle registration fees nothing is far from rise as part of the Legislature and zero. Gov. Rick Snyder’s 2015 Band-Aid plan for road funding. Making the sales pitch for more is a tough task. It’s important to remember two things: The cost of doing nothing is far from zero. One estimate puts the annual cost for vehicle wear and tear due to Michigan’s roads at $650. The extra 45 cents would add up to about $250 a year per person. As roads deteriorate, they become exponentially more expensive to fix. Often that means governments steer dollars toward roads that are already in pretty good shape — because it’s cheaper to keep them that way than to fix those that are too far gone. That triage causes some local roads to become scarred messes once they become too expensive for local governments to fix. We like the gas-tax idea because it amounts to a user fee — the more you use the roads, the more you pay. It makes sense as a component of any deal, but a slower step-up in that tax, or another way of spreading out the pain, might be more politically palatable. Or pair new revenue for road fixes with reform of the state’s no-fault insurance system that could save drivers money on their auto insurance — even more politically complicated but a real “grand bargain” if it could be done. The ball is in the Legislature’s court now, and the Republican leadership is debating how to approach a road fix. It’s been reported that it will likely be summer before a long-term counterproposal is forthcoming. It’s important to have a thoughtful plan that fully addresses the problem, and not another half-measure. But it’s also important to get something done — because it’s not getting any cheaper while we debate. tial development. Because underground infrastructure is out of sight, it’s unfortunately often out of mind. One such “out of sight” threat is the condition of Michigan’s stormwater systems. These systems were designed under older standards and have simply not kept up with increasing rainfall intensities and larger urban areas. The poor condition of these systems is realized through flooding, sinkholes and widespread property damage. Interestingly, Michigan’s population has increased less than 8 percent in the last 40 years, while the total urban footprint has increased by 50 percent. This means that we’ve built a lot more infrastructure while we’ve barely expanded our tax base. Furthermore, the severity of storms has intensified in recent years, as experienced by recent catastrophic flooding in Houghton, Midland and Detroit. Heavier rainfalls can lead to untreated sewage flowing directly into our rivers and lakes, as well as sewer backups into basements. Undersized and obsolete storm sewer systems overflow and cause widespread flooding, road washouts, stranded vehicles, flooded homes and businesses. Reports on climate change predict we’ll experience more intense storms in the future. We need to address stormwater infrastructure issues as quickly as possible. This is important not just for the quality of our natural environment, but for the stability of our economy. Not surprisingly, the issues come back to funding. First, there are fewer funds available today than in past years to repair or replace stormwater infrastructure. In decades past, much of our infrastructure was funded by federal grants. While many municipal leaders in Michigan would like to see the federal government make these types of grants again, it’s highly unlikely. It must be solved at the local level. The Michigan Legislature is looking to reintroduce legislation that would allow Michigan municipalities the option to establish stormwater utilities, which would provide all Michigan communities an equitable and transparent framework to finance much needed stormwater infrastructure upgrades. While there are laws in Michigan allowing municipalities to charge user fees for sewer usage and drinking water, thereby creating a funding source for sewer and drinking water infrastructure, judicial precedent has made stormwater utilities vulnerable to legal challenges, which is why this legislation will be critical. Michigan voters have spoken loud and clear — we must fix our infrastructure. The reality is that we have more infrastructure to pay for, and the longer we wait the bigger the emergencies get and the more expensive the fix becomes. Greg Kacvinsky is a stormwater practice leader, senior project manager and partner at community advancement firm OHM Advisors. leave at the close of a school year for higher pay elsewhere — sometimes as little as $2,000 more. Also last week, veteran tech CEO Meg Whitman visited Detroit to support a relaunch here of Teach for America, the now 30-year-old program that recruits newly minted graduates of the best colleges in America to teach in low-income schools across the country. school district is in year two of its contract with teachers, who received a 7 percent increase in the first two years, according to the nonprofit education reporting group Chalkbeat. The district and union negotiators were to open the contract to determine the third-year increase during the contract. Vitti’s suggestion of merit pay may be an opening gambit. Maybe this is a tangible way business can contribute to a special talent fund that could help retain talent at all schools — Vitti’s and charters. MORE ON WJR Listen to Crain’s Group Publisher Mary Kramer and Managing Editor Michael Lee talk about the week’s stories every Monday morning at 6:15 a.m. Mondays on WJR 760 AM’s Paul W. Smith Show. Paul Fortin, M.D. : Group wants to be flexible. Carolyn Wilson: Broader physician opportunity. tient center, Wilson said. Physicians would become investors in joint venture, she said. The developer would lease office space in the center to physicians. “We are likely to have a developer build the building. It gives more (financial) flexibility for Beaumont” on the projects, Wilson said. Bob and the Capital Markets experts at Fifth Third Commercial Bank provide critical market analysis, strategic guidance and capital-raising solutions to generate better results for your business. This is banking a Fifth Third better. care and adoption services in 1924. The nonprofit provides autism, behavioral health and disability services for adults and recently expanded into primary health care. This February, Judson Center opened a 3,000-squarefoot primary care clinic in Warren called The Judson Center Family Health Clinic. Hardy-Foster was instrumental in raising almost $700,000 in funding for the clinic, including a $500,000 grant from the Michigan Health Endowment Fund. Hardy-Foster serves on many local boards, including the Michigan Federation for Children and Families, where she serves as treasurer. Her accomplishments earned her a lifetime achievement award this year from the University of Detroit Mercy, her alma mater. was doing good and improving the lives of children and families. I knew working in the nonprofit industry was where I was supposed to be. You worked for Southwest for 36 years. Why did you decide to move on? I actually considered finishing my career at Southwest, but a recruiter reached out to me about the Judson Center position. I had always desired to be the CEO of a nonprofit. I learned a lot at Southwest, but I grew as much as I could there and they already had an outstanding CEO. Were there any early leadership challenges when you started? Judson Center opened a primary clinic? botics have long been associated with the auto industry, but the technology is increasingly prevalent in other industries, such as aerospace, life science, logistics and materials handling. Economic impact The show could result in $15 million to $20 million of direct local spending, with an expected 5,000 room nights booked at local hotels, according to the Detroit Metro Convention & Visitors Bureau. “Being able to host this kind of technology and innovation in Detroit is just kind of a wonderful showcase of how our community has continued to grow,” said Laura Coniglio of the DMCVB. Automate organizers have committed to having at least three iterations of the biennial event at Cobo in 2021, 2023 and 2025. Doyle declined to disclose the financial terms of the deal with Cobo and the cost to produce the event, but did say it was in the “millions of dollars.” In addition to the 20,000 convention attendees, the event draws about 1,000 paid registrants for an educational seminar. The convention, free to attend, is sponsored by participating companies. Doyle said sponsors for the event at Cobo will be nailed down as the date draws closer. Doyle said the difference in production costs between Chicago and Detroit was “nominal” and saving money isn’t the reason for moving. For Cobo and Detroit the event’s impact is potentially much more than visitor spending on food, gas and hotel rooms. Like the first FIRST robotics competition last year, which attracted 35,000 visitors to downtown Detroit, the event could help boost the city’s image. “It’s a nice feather in our cap,” Coniglio said. ders, especially since there has been an increase in the number of people receiving mental health diagnoses. adoption services. Philanthropy is really key to our success. About 15 percent of our revenue comes through philanthropy. What’s the biggest hurdle Judson Center is facing right now? Always know that there is value in what you have to bring to a nonprofit organization. Nonprofits need all different kinds of skills — strategic thinkers, great leaders and visionary people. If you have a passion for nonprofit work, I would encourage you to follow that dream. I have no regrets on my decision to work for a nonprofit when I thought I’d be working for corporate America. When I go home, I feel good knowing what I’ve accomplished. SOURCES: S&P Global Market Intelligence, (Marketintelligence.spglobal.com) and SEC filings. This list of publicly held companies is a compilation of the largest companies in Wayne, Oakland, Macomb, Washtenaw and Livingston counties that have stock traded on a public exchange. For companies not on a calendar fiscal year, revenue and net income figures are for the most recently completed fiscal year. 52-week highs and lows are for period ending April 2, 2019. B Incorporated in Dublin, Ireland but has operating headquarters in Michigan. C Incorporated in London, UK but has operating headquarters in Michigan. In December 2017, Delphi Automotive plc spun off its powertrain segment as Delphi Technologies PLC (NYSE: DLPH) while Aptiv PLC (NYSE: APTV) emerged as its electric architecture and autonomous driving-focused business. D Replaced Liam Butterworth who stepped down as CEO in October. E Formerly TI Automotive. Incorporated in Oxford, UK, for tax purposes but has operating headquarters in Michigan. F Currency conversion based on euro to dollars rate of 1.2002. G Sold its non-core switches and connectors business for $40 million in April. Sale part of a long-term shift toward high-tech transportation products. At DTE Energy, we don’t believe we have to choose between a healthy environment and a healthy economy. In fact, we’ve already accelerated our carbon reduction goal, cutting emissions in half by 2030 and by 80% by 2040 — a decade earlier than planned. And that’s while offering reliable and affordable energy to our customers. Better economy, better environment. We can have both. PRINT DATE: MAY 27 | CLOSE DATE: MAY 9 Contact Lisa Rudy at lrudy@crain.com for more information or to reserve your space. cludes: Rick Haas, Mahindra NA; Bruce Thelen, Dickinson-Wright, and Scott Sneckenberger, Plante Moran. Moderated by Chad Livengood, senior reporter, Crain’s Detroit Business. The panel will discuss: Expanding a business globally, foreign market research and strategies; cultural differences in business and impact of trade sanctions on global expansion. Altair Engineering, Troy. $29 Troy Chamber members; $36 nonmembers. Email: theteam@troychamber.com. Website: troychamber. com/events/going-global 5th Annual Small Business Workshop. 8 a.m.-1 p.m. May 7. The Lee Group. The Fifth Annual Small Business Workshop’s theme — “Navigating The Headwinds of Change” — addresses whether a business is ready for a competitive market, in light of potential economic changes. The workshop will feature speakers, panelists, community and corporate partners focused on assisting businesses while navigating a potential changing economic landscape later this year. TechTown Detroit. $75; early bird price $65 until April 19. Contact: Lisa Washington, email: meetings@meeting-coordinators.com; phone: (248) 643-6590. As Ford Motor Co. CEO Jim Hackett works to transform the company, his top lieutenants will take on new roles: One will be responsible for making money and the other will spend it on future tech and innovation. Jim Farley, 56, Ford’s president of global markets, will take over Marcy Klevorn’s mobility role in his new title of president of new businesses, technology and strategy. He’ll oversee strategy, Ford’s Smart Mobility subsidiary, its autonomous vehicle unit, research and advanced engineering, corporate partnerships and global data insight and analytics. Joe Hinrichs, 52, Ford’s president of global operations, will become president of automotive. He’ll be in charge of Ford’s global operations, including product development, purchasing, manufacturing, and marketing and sales, as well as the company’s global business units: North America, South America, Europe, China and International Markets Group. Klevorn, 59, president of mobility, will retire in October after 36 years with the company. Farley and Hinrichs’ appointments are effective May 1. The move marks the second top executive shift in less than two years for Hackett, who appointed Farley, Hinrichs and Klevorn to their current roles after he was named CEO in May 2017. Kelsi Horn has joined Truscott Rossman as an Account Executive in their Detroit office. Kelsi’s experience as an accomplished business owner has provided her with valuable insight in all aspects of client management. She is knowledgeable in project development, market research, as well as public speaking and team management. Kelsi also has experience working with the State of Michigan and in the Michigan House of Representatives. She is also the reigning Miss Black USA. Lindsay Gerber has joined Truscott Rossman as an Account Executive in their Detroit office. Lindsay’s tenure with Truscott Rossman started as a Communications Intern in early 2018. As an Intern, she effectively developed and became responsible for the implementation of the firm’s Intern Recruitment Plan. Lindsay quickly demonstrated her unique video editing skill set, which she developed as the Executive Producer for DTV (Davison Television) at Davison High School. Joe Davidson has been named President of Central Data, a Farmington Hills software and services company for Distributors across the Midwest. During his 12-year tenure, Davidson has been vital in the transition of on-premise to cloud-based ERP software for their customers. In 2018, Davidson led the acquisition of Lowery Systems of St. Louis expanding Central Data’s team and client base across two regional offices. Prior to his promotion, Davidson was the company’s Chief Financial Officer. An experienced workforce solutions executive, Jack Van Tiem, leads the staffing and business solutions operations for Kelly throughout the Midwest region, a five-state area that includes Michigan in addition to Indiana, Ohio, Kentucky and West Virginia. Jack is a collaborative and growth-minded leader. He’s continuously anticipating what’s next for customers and talent, and his strategic recommendations help clients ditch the script on old ways of thinking about workforce planning. NEW GIG? Preserve your career change for years to come. Amber Slichta: Financial ROI to keep model going. Joseph Cacchione: These jobs critical to care. Help me help yourself by tripling your money in less than 3 years on my three great inventions! POSITIONS AVAILABLE Harman Connected Services Inc. - Principal Engineer, 1 Position Novi, Michigan Principal Engineer, 01 position, Work Location: Novi, MI. Work with cust & req team u’stand sys & app req. Supervisory resp 3 reports. Lead dev Team to design & dev SW compo in C++ & Java Des & Dev multi process SW using android p’form source & vendor compo based on Android HAL arch. Mentor team with prior exp in dev framework & core service compo for Audio/multimedia tech. Prov tech recom on des, arch & solution for Android based embed prod. Lead global tech team prov guidance & ensure to impl high qlty SW. fix SW defect & rev fix. supervisory resp of 3. Exp req: Bach’s deg in CompSci, Eng Electo/ Electri or rel Eng deg with 5 yrs exp in IT & Embed SW dev. Alt: Master’s Deg in CompSci, Eng Electo/Electri or rel Eng deg with 3 yrs exp in IT & Embed SW dev. 3 yrs of exp in SW dev in C, C++ & Java, & exp deve in Android FW & HAL layers. Exp in add audio or mult med feat to embed p’’form using android FW & core serv. writing Binder IPC APIs in Java & C++. add JNI interfaces to interact with native code. android boot Proc, init Pro, core serv, network serv & media serv. Exp work with Sys Server, Service Mngr, State Mgmt tech. 3 yrs’ exp in SW des using object-oriented princi. Exp debug & analyz stack traces, tombstones, kernel traces. Deve tools - Git, GDB, ADB, Traces, NDK tools. Apply: send resumes to Harman Connected Services Inc, Attn: Mahesh GM/Job Code PE-HCS- M-05, to 2002 156th Ave NE #200, Bellevue, WA 98007. FOR YOUR FAMILY NOW…IS THE TIME…TO BUY A FABULOUS WATERFRONT COTTAGE ON ONE OF THE FOLLOWING LAKES: MICHIGAN, WALLOON, TORCH, CROOKED, BURT, MULLET CHARLEVOIX AND OTHERS. HARDWARE DEVELOPMENT POSITIONMERCEDES-BENZ RESEARCH & DEVELOPMENT NORTH AMERICA, INC. CALL JOE TO BE YOUR BUYER BROKER… AT NO CHARGE TO YOU! Mercedes-Benz Research & Development North America, Inc. has the following position available in Redford, MI: Engineer, Hardware Development: Define and develop internal combustion engine components from concept to production launch for engine variants and local market adaptation. Job code: BS-RMI. Mail resume: Attn: HR Dept, 309 N Pastoria Ave., Sunnyvale, CA 94085. Must reference job title and job code. Sister Pie owner Lisa Ludwinski, a finalist for a James Beard Foundation Award, plans to expand her business. Detroit bakery Sister Pie hasn’t signed a lease yet, but has an agreement to occupy a building at 8110 Mack Ave.
for the Mack Avenue building, but has a letter of intent with the owner. The owner, through Ludwinski, declined to be named or interviewed. Mack 1920 LLC, the owning entity, purchased the building in 2014 for $22,200 from the Wayne County treasurer, according to city records. Mack 1920 is registered with the state to Detroit-based Counsel Matters PLLC. Baking would be split between the two locations, Ludwinski said. Production had already been ramping up to meet demand, she previously told Crain’s, and the company is working toward making wholesale accounts with “a couple grocery stores.” Sister Pie sells products wholesale to The Farmer’s Hand market and Brooklyn Street Local in Detroit’s Corktown neighborhood, according to its website. It also sells pie and promotional gear online. level.” Since 2015, Saad has engaged with about 20 clients, mostly medium-sized to large hospitals like Brigham and Women’s Hospital in Boston, Georgetown University Hospital in Washington, D.C., and Cedars Sinai Health Network in Los Angeles. Oddly, no hospitals in Michigan, but Saad would like to change that soon. He said he is talking with two Michigan hospitals and hopes to have a contract this year. “Michigan was way ahead of the curve with EHRs,” said Saad, who said most health systems in Michigan began implementing the systems before he started DMI. “The first three years we worked with implementation. Now we are working to help systems with optimization, difficulties in gaining efficiencies, CEO Carl Bizon; and David Roberts, chair of the Carlisle Cos., remain on the board. “This is a classic case study in business school,” said Erik Gordon, clinical assistant professor with an expertise in public companies at University of Michigan. “My nose tells me the loan is to keep the company afloat until it’s sold, to show enough of a turnaround to get a deal. When you have a wholesale board change like that, it’s because the big strategic issues like a sale of the company are part of board strategy. The new board is probably one that has background in turnarounds and selling companies and isn’t tied to the old management.” The new board has its hands full as Horizon Global is well short of profitability and operational problems continue to plague the company. The company reported a $5.8 million charge related to customer fines for not delivering product on time in the fourth quarter alone. Its CEO has maintained the company is on the mend. “As a company, we have been taking aggressive action now, and we’ll continue to do so in order to position Horizon for long-term growth and profitability,” Bizon told investors on its earnings conference call on March 19. “The idea behind DMI is to get doctors to be part of the change at hospitals. We have been dubbed the ‘physician whisperers.’ We can bridge the gap between health care and technology and communicate with doctors at their level.” Hass Saad, M.D. cial problems there or exit the region altogether, Zeffiro said. “(Westfalia) was a bridge too far,” said a source close to the company who spoke to Crain’s on the condition of anonymity. “(Horizon Global) couldn’t absorb the acquisition.” And as the company’s executives were focused on integrating a troublesome Westfalia in 2017, things were also falling apart in North America. spring of 2018, less than year after his son’s funeral, and Zeffiro, who resigned on May 8, 2018, days after the company reported a $57.5 million net loss in the first quarter of 2018. Horizon named Bizon, formerly its Americas president, to interim president and CEO before making him the permanent top executive later that year. “(Bizon) is a cost cutter,” a source said. “Cost cutters are not builders, so the company is looking for savings where it can.” By the end of the second quarter in 2018, Horizon Global had posted a loss of $64.1 million and revenue had fallen by $30 million from the same quarter a year earlier. Bizon told investors missteps in its Europe-Africa business were to blame, but measures were being taken to correct them. “Decisions made regarding manufacturing consolidation, production sourcing and related logistics have overcomplicated this business,” Bizon told investors last June. “Moves that were made to improve margins and increase productivity were not effectively executed and are having a short-term adverse effect on our results.” But the Kansas City distribution center was still a problem. The company exited the second quarter of 2018 with $23 million in past due orders stemming from poor operations in Kansas City. Horizon Global has made improvements in Kansas City, but the plant ended 2018 with $6 million in past-due orders. It reported an operating loss of $29 million in the fourth quarter. “If you’re going to consolidate a bunch of operations into one place, that one place better work really well,” Gordon said. “If not, you’ve just doubled down on your troubles.” At the beginning of 2019, the company’s market cap fell below $50 million and faced delisting by the NYSE. It regained compliance by late March of this year. The company is continuing consolidation efforts by moving from its Troy headquarters at 2600 W. Big Beaver Road into its Plymouth location at 47912 Halyard Drive, the fourth location to be consolidated into that office. “We expect to realize some initial cost savings from this decision that will be related to reduced operating and facility expenses, but this action will have many benefits beside cost savings” including improving collaboration and culture, Bizon told investors in March. The time line for the move, like the company’s future, is unclear. don’t feel punished by their peers for taking advantage of them. Miller recounts an employer with a work-fromhome policy that was left to the discretion of managBrooke Miller ers to deploy. That created an inconsistency between two mothers with the same positions, one with a manager supportive of the flexible work option, and another who wasn’t. “These are two people with the same job, different manager,” she said, “and they had a 1,000 percent different experience.” Miller recommends pairing policies with employee education and manager training so everyone understands what is available and why family-friendly policies are important. “Part of how we are successful is to remove any barriers to brilliance,” said Dug Song, Cisco vice president and general manager and co-founder of Duo Security. “We have to accommodate life changes for people.” Many employers are rethinking what it means to be family-friendly. Sure, paid maternity leave is good. But paid leave for all new parents is better. And while prenatal coverage is fairly standard, why not bring health care providers on-site so parents can more easily access care? Throughout Metro Detroit, more employers aim to offer benefits that help employees with families to not only get by, but to excel — especially during the high-stress time of early parenting. Brooke Miller and Karen Evans speak to the Detroit chapter of the IPG Women’s Leadership Network at Commonwealth-McCann about policy development for parents in the workplace. Parental leave benefits are still not commonplace in corporate America, but are on the rise. Roughly 27 percent of U.S. employers offered parental leave in 2018, up from 20 percent in 2017, according to the 2018 Employee Benefits Survey by the Society of Human Resource Managers. That increase is largely buoyed by paid maternity leave, which was offered by 35 percent of employers in 2018, up from 26 percent in 2016. Paid paternity leave was also up: 29 percent of employers offered it in 2018 versus 21 percent in 2016. Parental leave benefits were also far more likely to be offered by larger companies, according to the survey. Twice as many companies with 10,000 or more employees — 60 percent of them — offered paid maternity leave, compared with those with fewer than 500 employees, 31 percent of which offered the benefit, the survey said. Those larger organizations also offered paternity leave at a higher rate, 52 percent versus 25 percent. Paid leave for adoption, foster children and surrogacy are also on the rise, but at a lower rate than traditional maternity and paternity leave. Other family-friendly benefits the survey reported include: JJ11 percent of employers offered on-ramping for new parents re-entering the workforce. JJ2 percent offered on-site parenting seminars. JJ49 percent offered an on-site lactation room, compared with 28 percent in 2014. JJ11 percent offered adoption assistance benefits, compared with 6 percent in 2014. JJ27 percent allowed employees to bring a child to work in an emergency. JJ3 percent offered subsidized on-site child care; 3 percent offered non-subsidized on-site child care. Ashley Tuomi, CEO of American Indian Health & Family Services in Detroit, is able to bring her baby to work with her for six months, easing family stress and giving her an opportunity to bond with her child without falling behind on the job. Quicken Loans has long offered a robust suite of family-friendly benefits, from fertility coverage to generous parental leave. In recent years, they’ve added to their offerings with ongoing support and education programming for working parents. “The coolest thing is our monthly support groups led by experts,” said Tony Saunders, COO of Rock Ventures, which provides support services to Dan Gilbert’s family of companies, including Detroit-based Quicken Loans. The six on-site employee groups meet to discuss shared experiences such as first-year parenting, single parenting, and miscarriage and loss. “It’s awesome to be able to offer that benefit because often we assume that having the child is the toughest part, but being a parent has its own challenges.” Even their on-site child care subsidy, which offers team members up to $400 a month to defray child care costs at the center located in the Quicken Loans building, helps to more deeply ingrain family culture into the workplace. “It’s cool seeing some of the team members come up the elevator with their kids,” Saunders said. “That’s a big piece of land. It’s wide open, which makes it desirable. You can basically do whatever you want. I think that site lends itself to some bigger buildings; big sites like that these days are hard to come by.” — Ryan Dembs, president and CEO of Dembs Development Inc.
field-based General Development Co. LLC on 211 acres formerly owned by Chrysler Corp. and purchased during its bankruptcy in 2010 for $2.5 million. Messages were sent to Friedman Real Estate and General Development seeking comment. 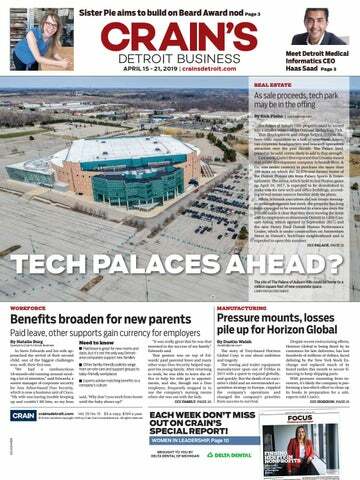 Oakland Technology Park's occupants include U.S. Farathane Corp. (240,000 square feet); Henniges Automotive Inc. (55,000 square feet); Faurecia North America Inc. (278,000 square feet); Incoe Corp. (135,000 square feet); Hutchinson North America (60,000 square feet); Hirotec America Inc. (216,000 square feet); Atlas Copco North America Inc. (120,000 square feet) and Renishaw (20,000 square feet). All together, it has at least 1.125 million square feet of building space plus another 55 acres in the center of the property that could accommodate between 175,000 square feet and 700,000 square feet, according to the Friedman Real Estate . 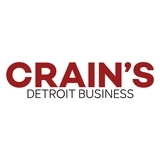 CUSTOMER SERVICE Single copy purchases, publication information, or membership inquiries: Call (877) 824-9374 or customerservice@crainsdetroit.com Reprints: Laura Picariello (732) 723-0569 or lpicariello@crain.com Crain’s Detroit Business is published by Crain Communications Inc. Chairman Keith E. Crain Vice Chairman Mary Kay Crain President KC Crain Senior Executive Vice President Chris Crain Secretary Lexie Crain Armstrong Chief Financial Officer Robert Recchia G.D. Crain Jr. Founder (1885-1973) Mrs. G.D. Crain Jr. Chairman (1911-1996) Editorial & Business Offices 1155 Gratiot Ave., Detroit MI 48207-2732; (313) 446-6000 Cable address: TWX 248-221-5122 AUTNEW DET CRAIN’S DETROIT BUSINESS ISSN # 0882-1992 is published weekly, except the last issue in December, by Crain Communications Inc. at 1155 Gratiot Ave., Detroit MI 48207-2732. Periodicals postage paid at Detroit, MI and additional mailing offices. POSTMASTER: Send address changes to CRAIN’S DETROIT BUSINESS, Circulation Department, P.O. Box 07925, Detroit, MI 48207-9732. GST # 136760444. Printed in U.S.A. Contents copyright 2019 by Crain Communications Inc. All rights reserved. Reproduction or use of editorial content in any manner without permission is prohibited. an Gilbert has added another Woodward Avenue building to his ever-growing collection of downtown Detroit real estate. The billionaire founder and chairman of Detroit-based Quicken Loans Inc. and Rock Ventures LLC has finalized the purchase of the Fowler Building at 1225 Woodward Ave. for an undisclosed price. Its previous owner, an entity affiliated with New York-based Sequoia Property Partners, put it on the market late last year for $22 million, or $396.40 for each of its 55,500 square feet. Sequoia paid just $700,000, or $12.61 per square foot, in 2012. An email was sent to a representative of the previous ownership group seeking comment. The first floor of the building is expected to be converted to retail while its upper seven floors are slated for office or residential conversion, said Jim Ketai, chairman of Gilbert’s Bedrock LLC real estate development, ownership, management and leasing company. The building will be cleaned out starting “right away” and the redevelopment will start “immediately,” Ketai said. It has been vacant for around three decades. “I have been eyeballing it for a long time saying, ‘I wish the rest of that block and these three blocks would be occupied and look good,’” Ketai said. “To me, with everything else going on on Woodward with the buildings we have brought back to life and the Hudson’s and Monroe developments happening, it was necessary to add this to complete the whole thing.” Bedrock is working on the $909 million development of what is expected to be the state’s tallest building on the site of the former J.L. Hudson’s department store and the $830 million Monroe Blocks development near the Quicken headquarters. The Fowler renovation budget has not yet been determined, but Ketai said “it will be a lot of money, a big investment.” “A lot of work needs to be done. The building is not in very good shape. It’s somewhat similar to the other buildings, like 1201 and 1207 (Woodward),” Ketai said. “All the core and shell needs work, we’ll repair the facade and put in new infrastructure and windows.” After being built for an estimated $150,000 (about $4 million today), the Fowler Building opened in 1911 as the home of Kline’s Ladies Wear, which was housed there until 1958, according to city historic documents. It was designed by the architecture firm Donaldson & Meier. The Fowler was one of the few buildings along the Woodward corridor south of Grand Circus Park that didn’t bear Gilbert’s fingerprints, either through ownership or a master lease for the retail space. Bedrock and Farmington Hillsbased Keystone Commercial Real Estate LLC were the brokerage firms on the transaction. An architect and contractor have not yet been selected for the renovation. J Macomb Township-based tooling supplier Baker Industries Inc. has been acquired by global manufacturer Lincoln Electric Holdings Inc. as part of a large-scale metal 3-D printing venture it plans to launch in mid2019. J Dockless electric scooter company Bird has more than doubled its fare rate in Detroit. The California company, which operates the rentable scooters in many cities in Michigan, doubled its Detroit prices from 15 cents per minute to 31 cents per minute, according to its mobile app. J The University of Michigan has committed to purchase 200,000 megawatts renewable energy — estimated at half its total purchased energy for the university’s Ann Arbor campus — from DTE Energy Co. starting in 2021, the energy company and university announced last Tuesday. J Moody’s Investors Service is giving Detroit City Council’s newly minted 2020 fiscal year budget high marks for using “conservative revenue assumptions” and socking away $45 million in surplus revenue to fund post-bankruptcy pension obligations coming due in five years. J The Ralph C. Wilson Jr. Foundation is putting $15 million behind a threeyear pilot aimed at better supporting and retaining entry-level caregivers at health systems in Southeast Michigan, western New York and Cleveland. J The Michigan Economic Development Corp. hopes to see $1 million of new business contracts born from its aerospace summit pairing global purchasers with local suppliers that took place last Wednesday at Ford Field. J Travelers rushing to catch their flights at Detroit Metropolitan Airport will have to hoof it for a few more weeks. After months of renovations, the trams in the McNamara Terminal were expected to resume service last Friday. That timeline has been pushed to early May, the Wayne County Airport Authority said in a statement. J DMC Harper University Hospital no longer faces the loss of millions of dollars of Medicare funding after it passed an infection-control inspection on April 3. J Lansing-based franchised moving company Two Men and a Truck International Inc. plans to hire around 500 new workers in Michigan ahead of what it expects to be its busiest moving season. J Michigan International Speedway will get an enormous new infield scoreboard to help spectators keep up with race leaders during the track’s motorsports weekends this summer. The new 150-foot high scoreboard will include screens on all four sides, MIS said in a statement. J The Detroit Tigers, despite a rapidly declining audience and two 98loss seasons, were profitable last season but remain sluggish in valuation gain, according to the annual baseball team valuations published by Forbes.com. The team is worth $1.3 billion, up from $1.225 billion a year ago, Forbes said. J Organizers of the Rocket Mortgage Classic in Detroit are launching a fundraiser, the Rocket Mortgage Classic Birdies for Charity, designed to capitalize on the excitement of the upcoming PGA tournament. J Fox Sports Detroit, which has the broadcast rights to Tigers games, said this week that it will have 17 “Players Only” telecasts in which former players offer running commentary and conversation during a game rather than traditional play-by-play. J The Dan Gilbert-owned Cleveland Cavaliers are renaming their home from Quicken Loans Arena to Rocket Mortgage FieldHouse as the Detroit-based mortgage company expands its Rocket Mortgage branding. J The Detroit Lions last Wednesday formally announced that Ford Field will get new artificial turf in time for the 2019 season. lease said. Koza didn’t immediately respond to a request for comment. Schlow, meanwhile, will turn toward incoming restaurants Prima in Washington, D.C., Time Out Market in Boston and Tico at Boston Logan International Airport. Last May, he closed his 3-year-old Greek tavern in Boston, Doretta Taverna and Raw Bar, the Boston Globe reported. The chef has been on TV, including on “Top Chef Masters” and on the Food Network, and wrote the cookbook It’s About Time: Great Recipes for Everyday Life. The New York native said in the release that Schlow Restaurant Group is “proud” of its involvement and of the restaurant’s food and service, but did not address the reason for the departure. The 65-seat Adachi is an upscale Japanese-inspired restaurant at 325 S. Old Woodward Ave. with sushi, sashimi, Japanese grilled meats and pan-Asian offerings. ichigan International Speedway will get an enormous new infield scoreboard to help spectators keep up with race leaders during the track’s motorsports weekends this summer. The new 150-foot-high scoreboard will include screens on all four sides, MIS said in a statement. It will have video screens, which will be 12 feet high and 19 feet wide, at the bottom to show replays and other action. Those will be 44 feet above the ground. The new leaderboard stretches 72 feet above the video screen and will totally encase all four sides, MIS said. The new digital leaderboard will show the top 15 positions, MIS said, and at the bottom, the final two positions will scroll through everybody in the race. The top of the leaderboard will feature a four-foot section that will be able to show the lap number of the race or the top speed in practice and qualifying, track staff said. “We continue to make enhancements to the facility to improve the experience for the fans on race weekends,” MIS President Rick Brenner said in a statement. MIS, which sits on 1,400 acres in the Irish Hills near Brooklyn, Mich., declined to disclose the cost of the scoreboards. The video system comes from Brookings, S.D.-based Daktronics Inc., which is perhaps the most notable U.S. provider of electronic scoreboards. It built the $8.5 million, 5,100-square-foot video board that hangs at Little Caesars Arena, Comerica Park’s $10 million scoreboard from 2012, and the original and replacement video boards at Ford Field. Daktronics declined to comment, deferring to MIS. Construction has already begun on the new scoreboard and will be finished before the first races in June, MIS said. Delta Dental celebrates Michigan Women Forward and its Power of 100 Women program for creating opportunity for Michiganâ&#x20AC;&#x2122;s women and girls to thrive and lead. Delta Dental is building healthy, smart, vibrant communitiesâ&#x20AC;Śevery day. We help organizations and businesses in southeast Michigan succeed by supporting initiatives that attract and retain talent, grow business, and make our cities and neighborhoods better places to live.